Everything is always changing in the material world. Values and morals are always changing according to the fickle nature of those captured by the three modes of nature. In the dual nature of this relative atmosphere, there are no conclusive realities but always there are two sides. So as aspiring seekers of the truth, we must look elsewhere for what is actually real. For that we must take shelter of disciplic succession. “Taking shelter” of parampara means always following closely in the footsteps of our predecessors and whatever we say concerning this philosophy is identical with what we have submissively heard from our guru, though spoken is our own words. A serious disciple has given up speculating, accepting that upon taking shelter of Krsna all previous conceptions of life and God are invalid due to our four defects. We have become determined to let the truth come down from the transcendental platform through every word that comes from the mouth of the pure, unalloyed devotee of Krsna. That is why we abandon speculation and seek the truth through submissive hearing. And what we have heard and only what we have heard, we repeat that same idea without any adding or deleting what we don’t like, or what we think others will not like. We do not change it to suit the world. Rather, we present it as it is and let the world come up to the higher standard. That is why in Vaisnava preaching about the process of devotional service, we generally do not say things like, “I think,” or “it makes perfect sense to me.” Any philosophical assertions about Krsna consciousness that begin with these words would be one’s own opinions and are undoubtedly debatable, subjective assertions and will not hold up to be true in all circumstances. They cannot be accepted as part of the science of devotional science. Srila Prabhupada said that any statements by devotees that start with phrases like these should be “made in the closet” and he would laugh. The reason for this, of course, is because the conditioned soul has four defects, and is prone to illusion and mistakes. So no matter how much we try, how much “sense” we have, or how much education and academic knowledge we have gained, there will always be problems with receiving our understanding by this deductive, ascending process of making philosophical assertions based on such understanding. But this is certainly not a safe place to put our faith. That fact is basic to our Krsna conscious understanding. Usually when we come to Krsna consciousness, we are thoroughly frustrated with our habit of speculation that just went in circles and got us nowhere. From the beginning we learned from Srila Prabhupada that today we may have some material intelligence and can see some pet conception so logically and to our teeny brains everything may seem correct, but someday our intelligence may fail, as it did in the case of Arjuna, and our mind may become confused. We can then ”fall down,” bewildered in our pursuit of knowledge by logic and reason and by our acceptance of ”what makes perfect sense.” So, safely we can only put our faith in the actual words of Krsna’s confidential servants. There we can find out what makes perfect sense. So the good news is we have the perfect captain to steer us out of our bewilderment. We are already safely traversing the material ocean if we are just patient and let the devotional process gradually work for us. Let’s not jump ship and start swimming to some island made of quicksand, or, in other words, let us not again start relying on our own powers of reason and logic, or following the advice and guidance of non-devotees. Instead, if we follow the path of pridelessness and humble submission to the pure devotee’s guidance, accepting him as fully capable of bringing us to the other side, there will be no danger. Nothing needs to be done to improve his already perfect writings. Just by carefully following in his footsteps, without interfering, everything will be under Krsna’s control and He will protect us and release us from the reactions of all of our past sins as He has promised. Eventually the desired results will come, supernaturally by Krsna’s grace. So as bhaktas and disciples we are required to give up all this speculation. That means whatever concepts about Krsna or devotional service we have concocted, or different pursuits of the absolute truth that we have created in our teeny brains by reason and logic, should be abandoned. “Religion is enunciated by the Supreme Personality of Godhead.” Whatever He creates is transcendental and He reveals to us whatever knowledge we need from within when we practice this submissive hearing from His pure devotee. All other vibrations are temporary and circumstantial. We cannot concoct anything and follow it, because It leads nowhere. We experienced that during our lives. That’s why we were so happy to finally take shelter at Srila Prabhupada’s lotus feet. Whatever comes from the mouth of our beloved spiritual master leads straight to Krsna because it is non-different from Krsna. The transcendental sound vibration from the lips of an unalloyed devotee like Srila Prabhupada is Krsna’s Internal Potency. To hear and to follow such instructions, one comes into direct contact with Krsna through the agency of this Internal Potency. To associate with Krsna means that one gets the benefit of the antiseptic and prophylactic qualities of Krsna and thus becomes purified and can eventually enter the transcendental atmosphere! This is the secret of devotional service. To follow the advice of conditioned souls will not have the same effect. The results will only be temporary. By following in their footsteps, we may develop our mind, or heal our bodies, or enhance our relationships, etc., but we will not ever be freed from the clutches of the modes of nature and will simply have to take another birth in order to receive the benefits of such pious or “good” pursuits. But we will not develop our love of God, because love of God can be reached by only one process. That process is devotional service. And we cannot whimsically add or subtract to this transcendental process. There are certain practices that have been created by Krsna that if we follow them without offenses and with service to his pure devotee, we will gradually develop the blessing of love of God. This gradual development of Krsna consciousness is independent of any outside influence. It is completely directed by Krsna through His Internal Potency. So best we take Krsna’s advise, and simple give up all these ”other processes of religion, and just surrender to Me.” In other words, abandon everything except the nine processes of devotional service, and we will eventually reach the highest goal. 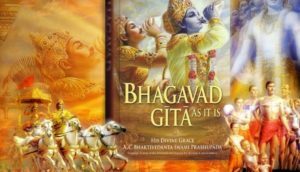 In the Second Canto of Srimad Bhagavatam, in the Third Chapter entitled “Pure Devotional Service: A Change in Heart,” Srila Prabhupada says that by hearing the Holy Name and following sincerely this devotional path there is a natural, expected result. We shall gradually feel the ecstasy of Krsna consciousness. He said that if that result does not happen naturally, “it is due to offenses only.” I pray with you to be protected from such offenses.